To make a long story short: if you aim to see more than three films a day at the festival (as one should), you will eat poorly. I think there was at least one day during TIFF’11 where I consumed nothing but three Grande bolds and a bagel. What doesn’t kill you makes you stronger, I say, but it’s best to be smart and pack a lunch. Even though dinner is the most costly meal of the day, keep in mind that lugging food around all day can be a chore. A helpful festival attendee I once met in line said that she makes a stack of sandwiches before the festival and puts them in the freezer, and then grabs one or two on her way out the door. It’s a good idea, and one that saves some time and money. Last year, I even cooked some chicken fingers before heading out to see We Need to Talk about Kevin at the Winter Garden. I cooked some extra nuggets for Tilda, but she didn’t bite. More nutritional value than a Booster Juice! 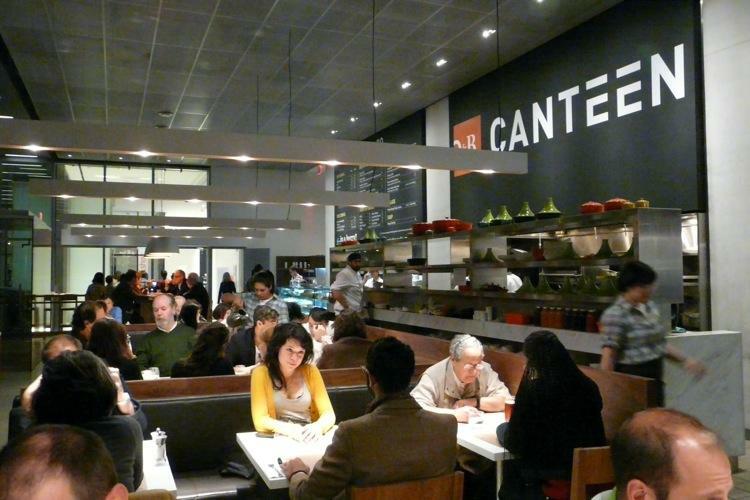 If you’re in the mood for a full sit down meal, however, it might be best to do so whilst catching a film at the Bloor Hot Docs Cinema. Located in the heart of The Annex, The Bloor is in close proximity to plenty of options for cheap eats of acceptable quality. The best bang for your buck near The Bloor, I think, is Sushi on Bloor, which offers great sushi for unbeatable prices. The service is usually pretty quick, so it’s an efficient choice. My personal favorite eatery near The Bloor is Southern Accent. Southern Accent is located on Markham St. just south of Honest Ed’s and it serves a sinful spread of Louisiana-style Cajun cooking. 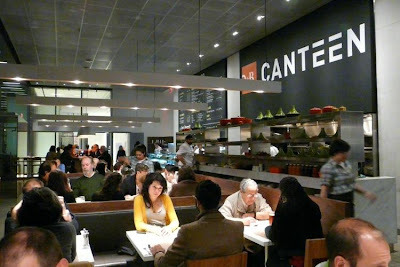 They offer a great prix fixe that gives patrons an appetizer, entrée, and dessert for $25. (Make sure to get the pecan pie.) Among the tasty offerings at Southern Accent are Blackened Chicken Livers and the occasional serving of alligator, and their Voodoo pasta is always a safe bet. They also have a Tarot card reader on site for added novelty. Service is usually a bit slower at Southern Accent (you can’t rush a good simmer), so this is an ideal stop for an extended break or après-film meal. Finally, it’s hard to say where to eat if celebrity sightings are on your menu. Yorkville is historically the standby place for sightings; however, the festival has since travelled to King St. as its main hub, so a trip to Sassafraz may not be as worthwhile. Perhaps Ben and Jen will be dining at Lee before Argo? Get your coffees while your friend grabs a spot in line and all will be fine. 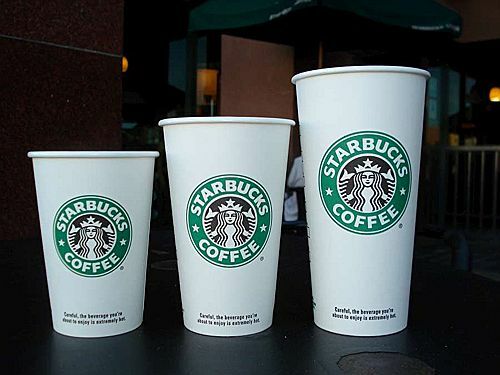 A grab and go at Starbucks is an ideal way to have breakfast if you want to get a few more minutes of sleep. Avoid the over-priced McMuffins. I find that adding a pumpkin scone to the coffee order is a good way to start the day since it contains at least three essential food groups: fruit, carbs, and icing. Additionally, make sure to note the locations of coffee merchants beforehand. Most theatre venues are in close proximity to several Starbi and there’s often a Second Cup, or even a Tim Horton’s nearby in case of emergency. Please use this handy map of the festival quarters: each TIFF marks a venue and each pink dot represents a Starbucks (the ones with letters seem to be top recommendations from Google Maps) . The worst venue for foodstuff is, without question, the Isabel Bader. One probably has a better chance of bringing an AK-47 onto an American airplane than of bringing a muffin into the Bader. Aside from water, the staff will tackle you if you try to slip one by. (Where Film meets Football?) The crew at the Bader rarely lets patrons inside more than fifteen minutes before the film starts – what with all the technical hiccups and gaffs that always happen there – so one can simply eat in line. Plan well and all will be well. Ah, popcorn. It’s my favourite food, and festival season brings out the worst in me. I’ll admit that most years at the festival include at least one day where I eat popcorn for both lunch and dinner. I have never tried it for breakfast, but maybe that will be my task for TIFF’12. (It’s at least two food groups, mom!) Most venues serve popcorn, except for the Bader (obviously) and Ryerson. The best popcorn both in terms of taste and in terms of value can be found at the Lightbox. TBLB serves cheap kernels and in modest sizes. There are no garbage bags of snacks here! Butter is also free, if memory serves correct, so the popcorn at the Lightbox will sate your craving for cinematic cuisine, but it won’t make much of a dent in your budget. Finally, what is everyone’s opinion on the popcorn fork? I received this tool as a gift last Christmas and I only mastered the art of the fork recently. This convenient tool lets film buffs snack without worrying about the stigma of greasy, buttery fingers. The popcorn fork also hosts a built in saltshaker if your daily intake of sodium is low. The fork likewise doubles as a pair of chopsticks if you sneak Chinese food or pad Thai into the theatre. Last and certainly least comes the inevitable life preserver of the festival: street meat. 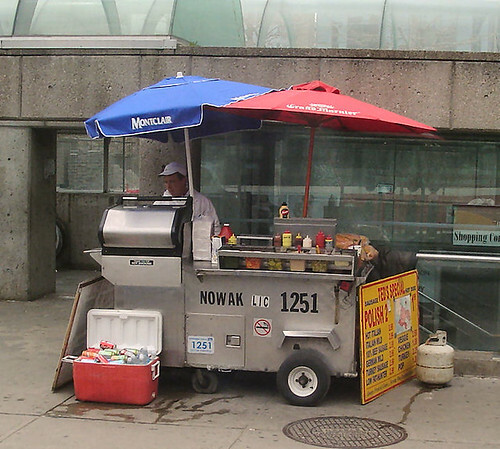 Torontonians might take their hot dog vendors for granted, since mobile food service is frowned upon in Ottawa. I find it a novelty, and a decent way to have a meal for $3. Loading up on condiments affords a hungry TIFF fan extra nutrients (I enjoy the random corn topping, but I draw the line at sauerkraut), and it’s a time-efficient way to refuel while walking to a theatre. TIFF is upping the ante by seeing more food trucks parked near theatres this year. Add some lobster to that hot dog and you have yourself a classy meal! Like food carts, food trucks were also been banned in Ottawa until the Trailer Pork Boys moved in, so I’m quite excited about this addition to the festival. Overall, though, I hope this advice provides some strategy. Top up that Starbucks card and make some baggies of snacks. The festival is always a fun event, so maximizing your efficiency will surely enhance your experience. Just think: there is always the chance that Penelope Cruz might be grabbing coffee too! Are there any festival diet tips you’d like to share?